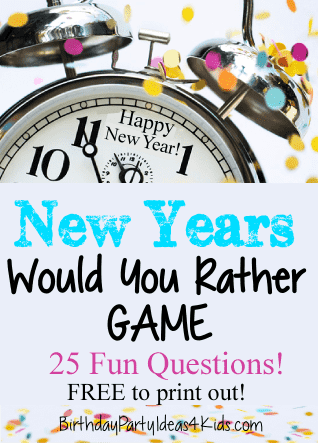 The New Years Eve Would You Rather game is fun for kids, tweens, teens, classroom and adult parties! It is easy to set up and play for large or small groups. Clean, rated G questions for everyone. Players choose one answer from the questions that give two choices. Print out the questions and cut them into strips. Fold and place in a container. Players take turns reading a question and answering it. Variation: For large groups or to make the game more active designate one side of the room for answer A and the other side for answer B.
corresponds with the answer they chose. 1. Clean up confetti in Times Square or ... after Zoo animals? 2. Eat Black Eyed peas for 1 year or ... Broccoli for 1 year? 3. Sing Auld Lang Syne to a large crowd or ... Make a toast ? 4. Volunteer at a Homeless shelter or ... at an Animal shelter? 6. Give up Soda for 6 months or ... French Fries for 6 months? 7. Dress up as the New Year Baby or ... Father Time? 8. Be twice as fast as you were last year or ... Twice as strong? 9. Be in Times Square for New Years Eve or ... Be on a beach? 10. Throw confetti from a skyscraper or ... Release 100 helium balloons? Dance on stage with your favorite band? Make resolutions for other people (but they get to make resolutions for you). A party blowout for a nose? 14. Have party noisemakers for feet or ... Confetti breath? 15. Go out with 15 new friends on New Years Eve or ... Stay at home with 5 old friends? Blow a horn every time you meet someone? 18. Live the last year over again or ... Move on to the New Year? Kiss strangers on the cheek for 1 week? Clink pretend glasses and say "Cheers" after every sentence? 21. Celebrate the New Year with fireworks or ... Go out dancing with friends? 22. Search for 9 New Years coins in a large fountain filled with coins or ... Pop 1,000 balloons? Walk backwards where ever you go? Be alone on a deserted island? Go forward 1 day to see what's in the future? Over 200 more Would You Rather Questions! And also these fun Minute to Win It style Games!